Being one of the most powerful desiccant dehumidifiers on the market, the EcoAir DD322 is more than you could hope for. While it has high levels of power and water capacity, there will be a few, minor downsides that come with this model. The extra power brings with it extra noise and added weight. If you aren’t in need of something quite this powerful, you might be more interested in the EcoAir Dehumidifier DD122 Classic MK5. Most powerful desiccant dehumidifier on the market. Large 3.5L water collection capacity. 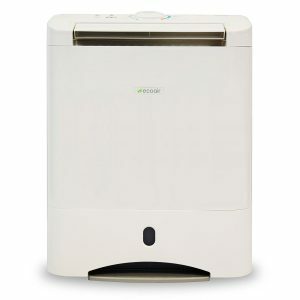 The EcoAir DD322 is a powerful desiccant dehumidifier that is perfect for home or office. The DD322 is capable of extracting up to 10L per day and effectively removes moisture to prevent bacteria or mould from forming. It is even useful when drying laundry or attempting to keep the furniture from being damp. You’ll find that this machine is powerful enough to be used even after the devastating effects of a flood or water leaks. With this, you will quickly be able to restore order in the home. The EcoAir DD322 boasts the ability to extract up to 10L of water per day. This powerhouse will extract up to 10L per day at 20°C and 60% relative humidity, which is amazing. This machine is best suited for a larger home or office. It would also be ideal to use after flooding. The laundry options also set this apart from other machines. Use the NORMAL modes to dry your clothing while saving money. The TURBO setting is going to lower the humidity levels than the normal setting. You can dry your clothes in approximately two hours, even in the winter time. One of the biggest selling features about the EcoAir DD322 is that it features a large, 3.5: water collection bucket. You’ll find it at the front of the machine and it easily slides out just like a drawer when it is time to empty. This means you don’t have to move the dehumidifier at all to empty the tank. Even when it’s completely full, the handle and removable lid make this simple to transport to the sink and empty. The viewing window in front allows for a quick check to see when it is full and there’s a light on the control panel itself that will glow when the bucket is full. If that happens, the machine will also shut down automatically. This model comes with a standard digital control panel. There are three standard settings the user can choose; auto, economy and high. There is also a timer that can be set in 2, 4 or 8 hours periods. If the machine accidentally tilts over, you won’t need to worry; it is equipped with tilt over safety protection and will power off to avoid a hazard. When there is a power loss, the auto-restart function will restore the unit to the same settings after the power comes back. 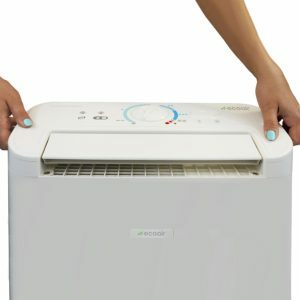 The EcoAir DD322 dehumidifier features the 150° oscillating louvre settings and even offers options to aid the air distribution. Set the unit to swing in an up, front or wide manner or it can sit still to focus on one area. This would be useful if you are fighting an area of mould. While this isn’t an ideal candidate for portability due to its larger size and 7.8kg weight, it is still capable of being moved without too much effort. The EcoAir DD322 is equipped with a collapsible carrying handle to makes things a little more manageable. The one item this dehumidifier seems to be lacking is that it doesn’t contain an ioniser or anti-bacterial filter. It does feature a standard dust filter instead. Featuring the E7 technology, this unit will run multiple algorithms to manage power, temperature, and humidity while optimising the performance. This enables a reduction in energy consumption and even provides an Overdry Protection that keeps the humidity from going too low. The continuous auto sensor and fan will keep the air circulating and the level of humidity consistent throughout the room. Running in economy mode, you can expect the DD3 to run at 400W per hour, which is pretty efficient considering the size. When running the turbo mode, you can expect that to jump up to 700W per hour. Once you’ve used the unit a few days and brought the humidity levels where they need to be, the machine should run less and there won’t be as much water in the tank to be emptied. If you would rather not empty your tanks, this machine is capable of being attached to a hose. The 1 M hose is provided in your box, simply remove the rubber plug in the back of the dehumidifier and pass the hose from the back to the front water tank. The moisture will then drop through the hose directly into your drain or sink. Make sure not to lose that rubber plug, however, just in case you want to remove the hose at a later time. Considering this is a powerful machine and extracts more moisture than most other desiccant dehumidifiers, I expected that it was going to be slightly louder. What I didn’t expect was that it would have a 42-decibel rating! Considering the other EcoAir Dehumidifiers tend to run between 32-36 decibels, you’ll notice a difference in the noise level while using this machine. Keep in mind that 42 decibels are still reasonably low compared to other dehumidifiers, it just isn’t what I’m used to seeing in an EcoAir as they are known for the quiet operation. If you have the money to invest in a powerful machine such as this EcoAir DD322, then it is certainly worth the money. Between the laundry modes, E7 Energy Saver Technology, and the larger water bin, you would be getting an exceptional machine. If the cost is too high and not what you were hoping to spend currently, then you may find that the EcoAir DD122 Classic to be more of what you are looking for. Check it out at Amazon.